Three savage reviews later, Coward responded in verse. The very fact that I exist. Black hatred for my very guts! Must be a waste of your own time? What is my crime, beyond success? With such surprising, rising bile? Oh dear me no, they merely smile. From what they conceive as art. With such unfriendly, jaundiced eyes. No clue, no key to your dark mind. (Did I once meet you and forget you? Have I ever been your debtor? If I knew, I shouldn’t worry. 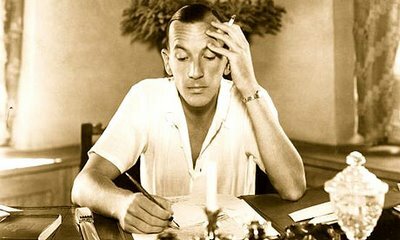 A month later, Greene reviewed Coward’s play Blithe Spirit, calling it “a weary exhibition of bad taste”. So much for the soothing power of verse, though twelve years later, the feud had finally died down, and Greene rented Coward’s house in Jamaica as a holiday home. A curious footnote: Coward acted the part of Hawthorne in the film version of Greene’s Our Man In Havana.